"I received this recipe at a Cake and Candy store when I signed up for a class. We made fall leaves and put them in a clay pot - they looked great! For best flavor results use pure Mexican vanilla the creme de la creme of vanillas. 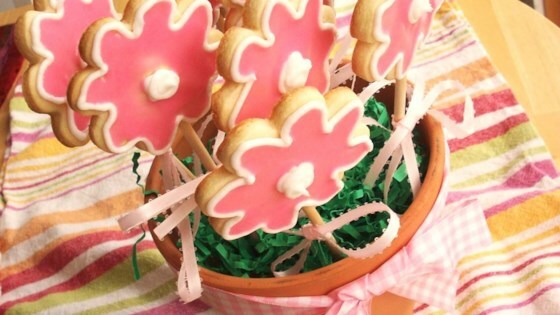 You will need about 6 dozen dowels, cut to approximately 6 inches (with some longer and some shorter) for cookie sticks." Cream butter and sugar. Add eggs and flavorings and mix well. Stir flour, baking powder and salt together. Add to batter and mix well. Chill 3-4 hours or overnight before using. Roll cookies out approximately 1/4 inch thick and insert cookie sticks at least 1/3 to 1/2 way into cookie. Bake cookies at 350 degrees F (175 degrees C) for 8-10 minutes. This dough keeps well in a covered container in the refrigerator for a couple of weeks. Decorate as desired. Display 3-7 cookies in a 6 inch clay pot (depending on size of cookie). Weigh pot down with dried beans and cut a circle of Styrofoam to fit snugly into top. Add ribbons and enjoy. This is the only cookie dough I use for all my holiday cookies. The only change I made was switching the butter flavored extract with vanilla, or sometimes almond. Kudos!